In less than 13 hours, we will be doing the Winter Solstice Meditation at the exact time of the solstice, which is at 4:28 PM on December 21st. Thanks again for the efforts of everyone doing any of the Multidimensional Portal Meditations over the last 4 days, the energies are rising because of your efforts. This set us up nicely for one of the most important meditations this year. 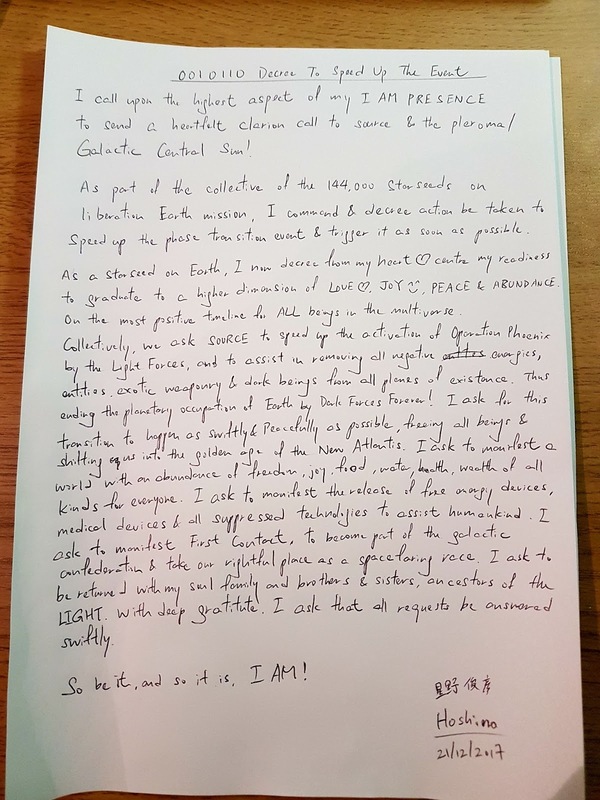 There were a couple of interesting updates from Corey Goode on Monday, warning us the possibility of partial disclosure. Although Cobra has already mentioned in the past that only a FULL disclosure is accepted, it is also down to us to use our group consciousness to state our intention to have this and The Event as soon as possible. Therefore, it is a perfect opportunity for us to use the Winter Solstice meditation to call for a full disclosure. Below is the guided audio for this meditation in English. Please also join us in the Multidimesional Portal meditation at 2:30 PM GMT if possible, which use the same instructions as the Winter Solstice Meditation. As I mentioned in the last update before, we will skip the Natural and Man-made Disasters Meditation at 4 PM today, so that people can take a rest beforehand and have their full focus on the Winter Solstice meditation. You can also say the 0010110 Decree before or after any of these meditation, which will be done at the end of each meditation on Discord. I wish you all a very beautifull solsetice meditation. May your intention to bring in peace, justice, freedom, and abundance to Planet Earth and her inhabitants come true. I my self was guided to plant violets and a skimmia to reinforce the energys of friendship family kinschip and most of all growth. This added to my daily intent to be the best me I can be. So my "job" for the day is already done :-) Back to doing the dishes walking the dog and spending my afternoon with my sick dad. I wish you well on your Path of Light. Take good care of your self and joyfull chrismasblessing to you all.